Cute and professional is not always an easy task- it can be difficult to think up feminine and professional outfits for the office, while still incorporating pieces of our personal style. Spring style can be a breathe of fresh air for us girls who are dying for new colors and patterns. One pattern that is super hot this season, looks professional, is chic, and stylish in one is stripes. Stripes are being shown in blazers, skirts, pants, and dresses. They are a safe go-to for the office, yet are stylish enough to not lose touch of your fashion side! 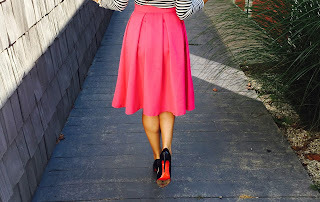 Take a look at some of these office-worthy stripe inspired outfits below. Best of all they .. they are all affordable for any woman to try!